Daisy Narayanan, Deputy Director for Built Environment at Sustrans Scotland, reports, in this briefing from Transform Scotland, on the activities of the recently-formed Active Travel Task Force. In 2016, two segregated cycle routes were voted down – the second phase of the Bears Way from suburban Milngavie to the boundary with Glasgow alongside the busy A81; and the Holmston Road lane in Ayr, which was voted to be ‘ripped up’. Both provided better journeys for all and were two of Scotland’s newest substantially segregated cycling routes. In Edinburgh the city centre East-West route faced substantial opposition, and Scotland’s first ‘shared space’ scheme in Kirkintilloch in East Dunbartonshire continues to generate heated debate. These projects brought into focus the barriers that Local Authorities and other delivery bodies face on the ground delivering projects that impact on the urban realm and status quo of drivers. At the Active Travel Summit, Humza Yousaf MSP, Minister for Transport and the Islands, reiterated his commitment to the CAPS vision of 10% of journeys to be made by bike by 2020, as well as his commitment to seeing segregated, safe cycling infrastructure being delivered to help deliver that vision. The Active Travel Task Force was subsequently set up provide recommendations to tackle barriers to the delivery of such projects. The remit of the Task Force is to identify and make recommendations to the transport minister on ways to improve delivery of ambitious, inclusive walking and cycling projects in Scotland, helping to create high quality places and communities that support health and wellbeing. 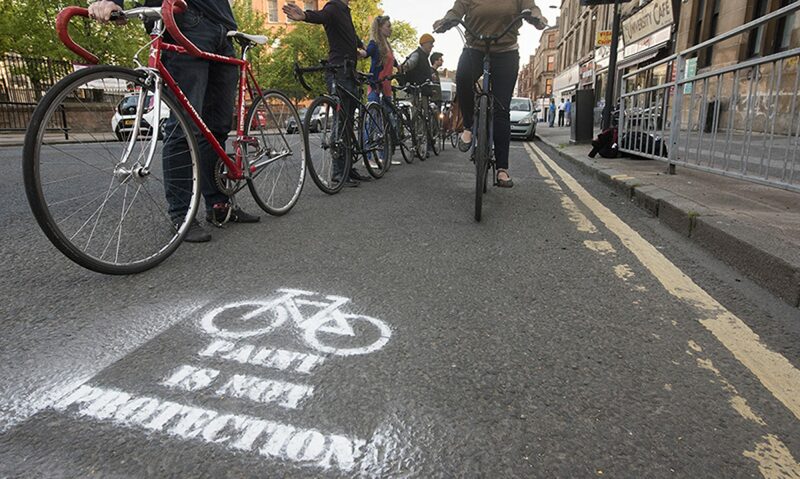 The Task Force wanted to receive evidence not just from people and organisations who are pro-cycling and walking, but also from those with wider concerns, and even vocal objectors to these walking and cycling projects. Fifty-five written submissions were received, along with two oral evidence gathering sessions from the Local Authorities who delivered the five aforementioned projects; consultants; and community groups both supportive and opposed to the projects. At the forthcoming Ministerial Summit on active travel, the Task Force will present the findings of the call for evidence and work to date. The final report with recommendations on future actions will be presented to the Transport Minister Humza Yousaf in December 2017. Barriers need to be identified – local, national, legislative and cultural – however, we need to remember that there have been positive steps and we don’t need to start from scratch. There is a lot of ongoing work with the Planning review, NTS and STPR refresh, Climate Change Plan. The timing of the Task Force work should be integrated with these. A lot of discussion on ‘active travel’ – but what does it really mean? There seems to be agreement that narrative needs to change from walking and cycling to quality of life/quality of place. A powerful way to give politicians (both local and national) support would be to approach it from the public health angle. There needs to be more visible leadership at both the national and local levels. We need to look at future technologies with respect to urban mobility and integrated smart cities rather than assume that car ownership/the way cars are used will remain the same. Community Engagement: How does one capture ALL voices? How do you reach the middle ground and avoid the loud minority groups? Evidence: Stats vs. stories. Businesses need to be better engaged. Processes: Transport and Planning need to be more joined up. Processes need to be simplified. Standards of design and quality of infrastructure – do LAs need more clear guidance? Since February, the Task Force has been in ‘listening’ mode. We have been careful not to jump to conclusions or start to write recommendations before we hear from everyone. It has been a thorough and meticulous process so far and laid the foundation for some intensive work over the summer and early autumn. The Task Force is clear that we want practical, short, medium and long term recommendations – ones that will make it easier for delivery agencies in the short term to deliver these key projects and in the long term create a transformational change.